It wouldn’t be an exaggeration to describe the development of non-Euclidean geometry in the 19th Century as one of the most profound mathematical achievements of the last 2000 years. Ever since Euclid (c. 330-275BC) included in his geometrical proofs an assumption (postulate) about parallel lines, mathematicians had been trying to prove that this assumption was true. In the 1800s however, mathematicians including Gauss started to wonder what would happen if this assumption was false – and along the way they discovered a whole new branch of mathematics. A mathematics where there is an absolute measure of distance, where straight lines can be curved and where angles in triangles don’t add up to 180 degrees. They discovered non-Euclidean geometry. Euclid was a Greek mathematician – and one of the most influential men ever to live. Through his collection of books, Elements, he created the foundations of geometry as a mathematical subject. Anyone who studies geometry at secondary school will still be using results that directly stem from Euclid’s Elements – that angles in triangles add up to 180 degrees, that alternate angles are equal, the circle theorems, how to construct line and angle bisectors. Indeed you might find it slightly depressing that you were doing nothing more than re-learn mathematics well understood over 2000 years ago! If a line crossing two other lines makes the interior angles on the same side less than two right angles, then these two lines will meet on that side when extended far enough. This might look a little complicated, but is made a little easier with the help of the sketch above. We have the line L crossing lines L1 and L2, and we have the angles A and B such that A + B is less than 180 degrees. Therefore we have the lines L1 and L2 intersecting. Lines which are not parallel will therefore intersect. At most one line can be drawn through any point not on a given line parallel to the given line in a plane. In other words, if you have a given line (l) and a point (P), then there is only 1 line you can draw which is parallel to the given line and through the point (m). Both of these versions do seem pretty self-evident, but equally there seems no reason why they should simply be assumed to be true. Surely they can actually be proved? Well, mathematicians spent the best part of 2000 years trying without success to do so. Why is the 5th postulate so important? Because Euclid’s proofs in Elements were deductive in nature, that means that if the 5th postulate was false, then all the subsequent “proofs” based on this assumption would have to be thrown out. Most mathematicians working on the problem did in fact believe it was true – but were keen to actually prove it. 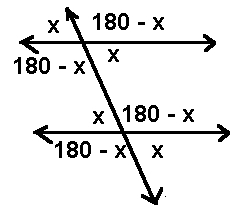 As an example, the 5th postulate can be used to prove that the angles in a triangle add up to 180 degrees. This is the familiar diagram you learn at school – with alternate and corresponding angles. If we accept the diagram above as true, we can proceed with proving that the angles in a triangle add up to 180 degrees. Once, we know that the two red angles are equal and the two green angles are equal, then we can use the fact that angles on a straight line add to 180 degrees to conclude that the angles in a triangle add to 180 degrees. But it needs the parallel postulate to be true! In fact there are geometries in which the parallel postulate is not true – and so we can indeed have triangles whose angles don’t add to 180 degrees. More on this in the next post. Non-Euclidean Geometry II – Attempts to Prove Euclid – The second part in the non-Euclidean Geometry series. The Riemann Sphere – The Riemann Sphere is a way of mapping the entire complex plane onto the surface of a 3 dimensional sphere. Circular Inversion – Reflecting in a Circle The hidden geometry of circular inversion allows us to begin to understand non-Euclidean geometry.